A charm pack, some coordinating solid-ish turquoise and a Lil' Twister, purchased rather impulsively at a quilt shop last year. I love the idea of the Twister and expected I would find lots of cool ideas on how to use it once I set my mind to it. Unfortunately that was a far as this idea got after purchase. Onto the UFO list for 2012 it went. So I was excited and started in on it pretty early. When I should have been working on other projects instead. Projects with more definite deadlines. And then I got back to what I should have been doing and this got set aside again. But this past weekend was the NFL Draft, which means the hubby is glued to the television watching a bunch of guys decide the fate of a bunch of college-graduating-age football players...please leave him alone! So that meant I could sew! Friday night I prepped, as I knew the hubby would be sleeping in - sew borders on in preparation for cutting (quietly) on Saturday morning. Saturday morning I took a deep breath and hoped this would all work out. I had my doubts that cutting with this wonky square thing would truly produce something worth the effort and expected I'd be ripping and resewing and laying things out 23 times each before I got it all together. Row one down...so far so good. And actually, it was easier than I expected to keep the pieces straight. My worst trouble was the little rubbery feet on the Lil' Twister that didn't allow me to moosh the fabric right under the ruler. I think if I used it again I'd turn it over so the feet are up and I can get the fabric flattened under it. (As it was, some of the seams wanted to not lie quite flat without encouragement - they were sewn just fine, but you can only iron something so much before you realize that it's got too many layers to lie truly flat-flat.) Or maybe peel off those little feet...that idea, of course, didn't occur to me until much later...and flipping the tool over? Well, that was a great idea BEFORE I started cutting...it goes one way or the other, not interchangeable! I had intentions of showing more of the layout, but all of a sudden I'd cut all the pieces and forgotten completely about photos! But here's the hacked up and layed out pieces. Then I had to cut a lot of super skinny sashings. (They finish 1/2"!) And sew carefully. You know you've got to sew super straight when they're skinny - even a little variation is much more obvious! But I managed. And sewed and sewed and sewed. With pinning and pinning and pinning. 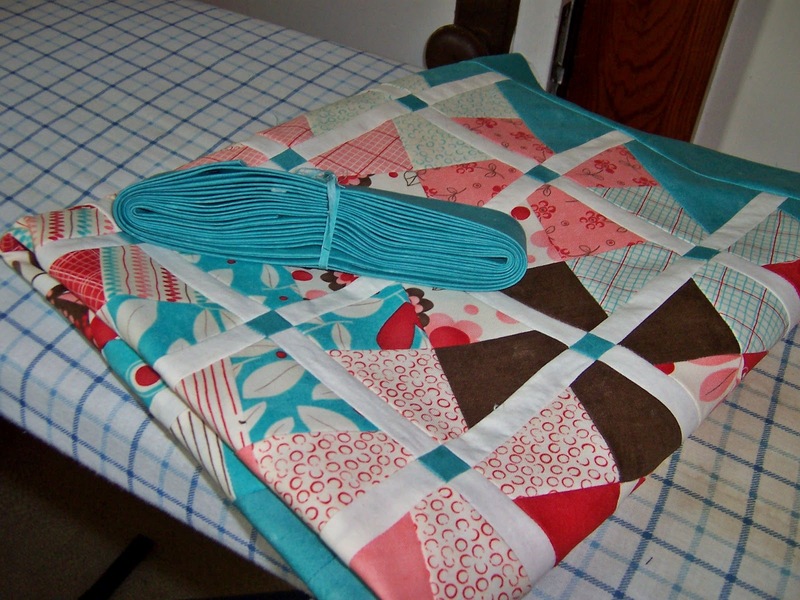 I went to bed Saturday night with the center sewn together and it just needed borders. I wasn't sure what I wanted to do and it was getting late, so I decided to sleep on it. After looking and auditioning the turquoise, I decided this would work nicely and sewed it down. Finished size is about 30"x34"...I think...something close to that, but rather small. 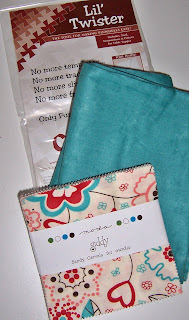 And then I made binding with the rest of the turquoise. I don't have any plans to quilt this any time soon, but figured it made sense to have the binding ready (and the fabric find-able) when I decide to quilt it. And now I see Judy has chosen #2 for this month. Oh dear...that's a very involved cross-stitch project that got put aside because something went wrong...I don't even want to THINK about that one, much less work on it, but that's what this challenge is about...so I suppose I'll go dig it out and think on it a bit. 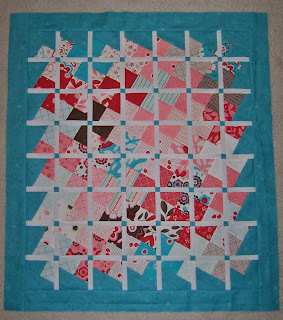 In the meantime, I've got a baby quilt and a graduation quilt I can distract myself with! 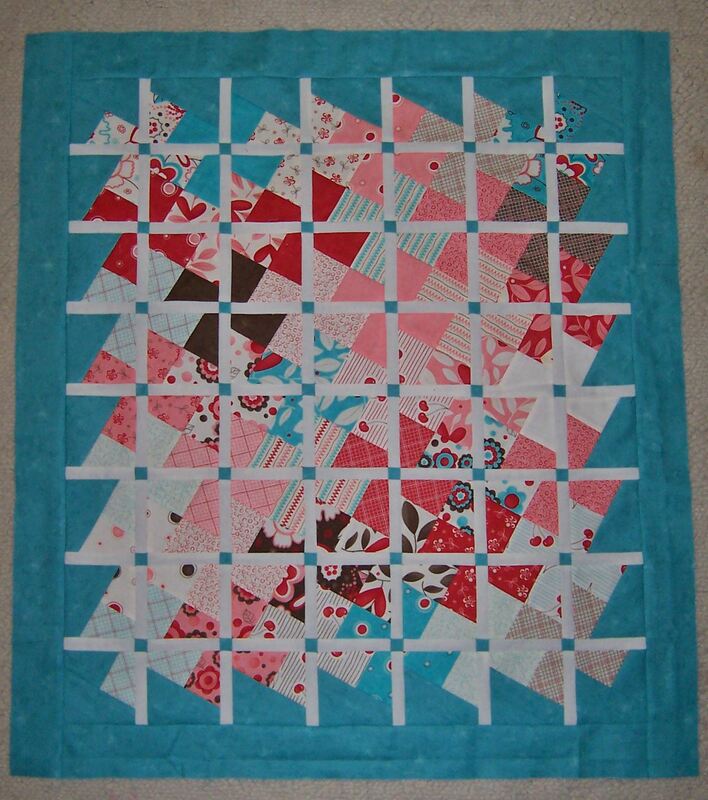 Girl, you are a quilt piecing machine! I don't know how you get so much done so quickly, even with the assistance of your cute helpers. 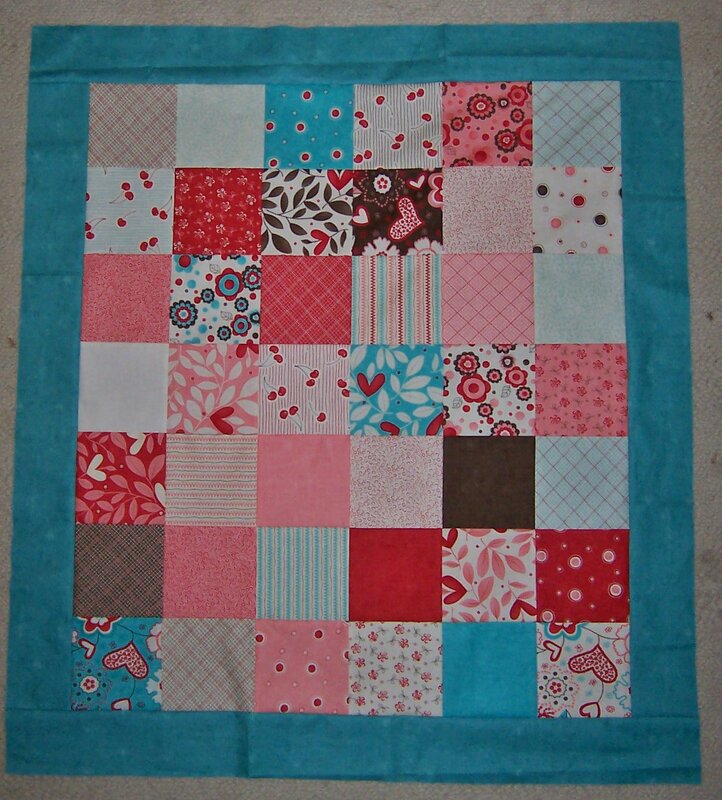 Your Twister quilt is really pretty; U look forward to seeing it quilted. 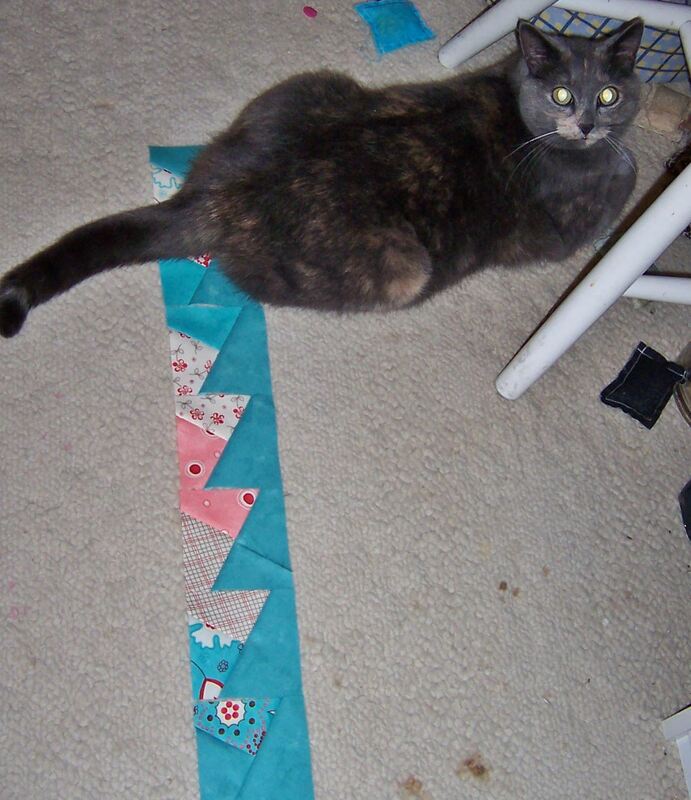 I always cut the binding too when I finish a top; got three waiting for quilted tops! (I thought I had commented on the previous post, but must have not done it correctly. Duh!) 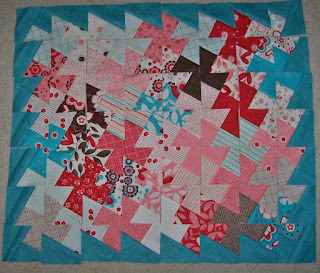 ---"Love"
I really like how the quilt turned out. I tried those little plastic feet on my rulers and found the same problem. They raise the ruler too much above the fabric for a good straight cut. Then I found little sandpaper circles. Try them, they work really well! That twister thing is pretty cool. I had not seen it before. 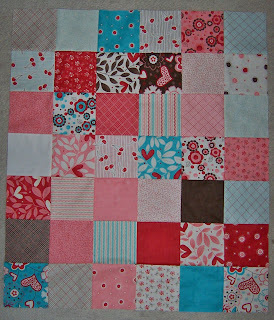 Your Lil' Twister is really cute, I love the pinks and turquoise together! Making the binding is a great idea, it will make it so easy when you decide to quilt and bind it. That is a great finish! Very pretty1 I think I need to pull out my twister tools again and try them with sashing.